Chandler Jones is one of the Cardinals’ most talented defenders, he may have put up the worst performance of all of them on Sunday. Jonesineffectivective in his pass-rush, run-defense and undisciplined. He was called for three penalties. Jones has the ability to be an absolute game-changer, but he struggled mightily against the talented Joe Staley. The linebacking group of Deone Bucnanon and Josh Bynes were the most effective for the Cardinals on Sunday afternoon. Both held their own in pass coverage, but it was their speed that made the difference in run defense, as they were essential in getting to ball carriers while the 49ers tried to establish their outside zone rushing scheme. After struggling to complete much more than screen passes in the first half, Josh Rosen and the Cardinals’ passing game found their stride in the second half. With plenty of time to find open receivers downfield, Rosen was excellent in the intermediate area over the final two quarters, connecting on several big throws down the seam, namely on his two fourth-quarter touchdown passes to push the Cardinals ahead late. Larry Fitzgerald has long given the 49ers’ secondary problems, and today was no different. The veteran wideout was a major part of the Cardinals’ comeback, racking up 97 of his 102 receiving yards on six second-half receptions, five of which were converted for a first down or touchdown. The 49ers did a good job bottling up David Johnson on the day, limiting him to just 3.7 yards per carry on 16 attempts. San Francisco was largely able to avoid the significant breakdowns in their run fits that have plagued them in recent weeks, and while no one player stood out above the rest, the result was solid and effective team run defense. Winning one-on-one matchups to generate pressure has been a problem for the 49ers for most of the season. In the first half, San Francisco found success with stunts to get free rushers and bother Rosen in the pocket. However, once the Cardinals were able to adjust and the stunts were no longer able to get home, the 49ers had nothing to fall back on, and San Francisco’s struggling, banged up secondary was left exposed. With the zone running scheme that the 49ers deploy, the run blocking at the center position is so important. Unfortunately for the 49ers, Erik Magnuson was terrible in this aspect of the game, consistently being beat by Cardinal interior defensive linemen who forced the running back out of his intended hole. Things only got worse for Magnuson when the 49ers were driving late to tie the game, as he snapped the ball over CJ Beathard‘s head ending the 49ers chances. It’s no secret that the 49ers are going to struggle to find ways to put points on the board. It seems that their best chance at getting touchdowns will be to find ways to get the ball into Marquise Goodwin‘s hands. Goodwin scored the 49ers’ only touchdown of the day when he took a shallow slant route and outran Patrick Peterson and the rest of the Cardinals’ defense. Goodwin also had a half of a step on Peterson deep later in the game, but the ball was slightly underthrown, and that allowed Peterson to break up the pass. For much of the day, Arizona looked like the offense that was our second-lowest graded entering the week. 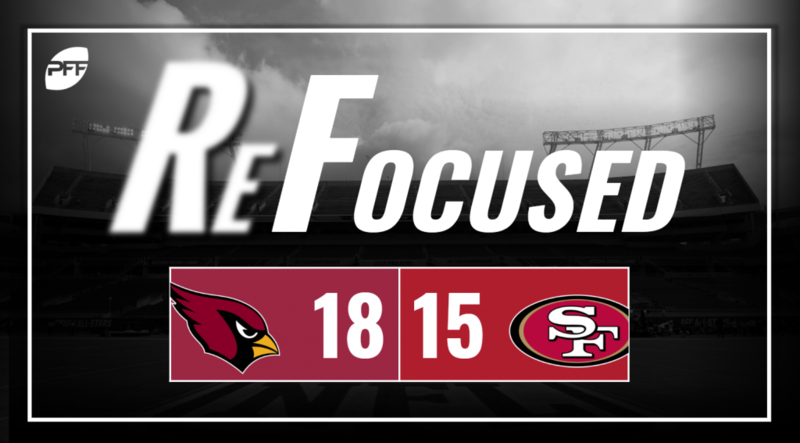 However, the lights flipped on in the fourth quarter, and the Rosen-to-Fitzgerald connection was enough to power the Cardinals’ second win of the season. The 49ers have shown that they have great talent at the right positions up front on the offensive line, but that only goes so far when your quarterback is unable to make the necessary throws. The 49ers need a complementary running game if they are going to be an effective offense with Beathard, and they were unable to get much going on that front on Sunday.